�Indeed, you exist neither yesterday nor today nor tomorrow, but are absolutely outside all time. For yesterday and today and tomorrow are completely in time; however, you, though nothing can be without you, are nevertheless not in place or time but all things are in you. For nothing contains you, but you contain all things.� � St. Anselm. 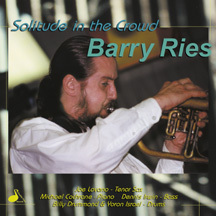 Barry Ries, a world-class trumpeter-drummer, chose the above quote as prologue for his startlingly accomplished debut album, Solitude In The Crowd. Anselm�s meditations express principles of inclusiveness and universality � and fluidity within time � that Ries embodies in his musicianship. Soon after Ries entered North Texas State in 1970, he joined the school�s prestigious One O�clock Band, �which opened doors for me. I started getting calls for all these dance bands that would come through Dallas, from Ted Weems to Ray Anthony to Ralph Marterie, all with a carryover from the old Harry James trumpet-player-with-big band. It was experiencing a lost era, the last bit of something I grew up seeing on television � country clubs, people dancing, the old sound where you�d take 8-bar solos with Harmon mute and the stem in it. In 1977 Ries took a gig in Miami, where he returned to the trumpet and met the multi-instrumentalist Ira Sullivan. �At that time Ira had really focused all his instruments � the trumpet, flute, soprano, alto and tenor � and he sounded great on all of them,� Ries marvels. �He�d play a set and wouldn�t stop, everything segued. He�s all about vibe and ambiance, which is where I�m at. When I play gigs I�m more into the mood, even if it might not be a perfect performance. I don�t necessarily want people to think only about the trumpet when they listen to me. Within six months, Ries joined Gerry Mulligan�s Concert Jazz Band, �sort of in between Swing, Dixieland and Jazz � Gerry falls in a funny category." We became good friends, and he was very enlightening. He introduced me to Don Sebesky, who turned me on to a lot of studio work, and I do a lot of things with Don to this day. Gerry also introduced me to Todd Coolman, who in essence got me an audition with Horace Silver; that�s also when I started working with Lionel Hampton. Ries presently resides in Boston, where he performs and teaches on both instruments. His unique way of telling a story with just the right blend of harmonic-rhythmic flexibility and melodic essence shines throughout Solitude In The Crowd, and dovetails with the sensibility of his superb collaborators. �On this date,� he says, �I wanted to use players who cover a lot of ground, go inside and outside. Dennis Irwin is a very important energy here. He provides that deep foundation which is needed in this sort of playing. It was Dennis� suggestion that Yoron Israel, Billy Drummond and Michael Cochrane participate in this project, so many thanks to Dennis. Harry Warren�s �Summer Night,� from the 1936 show Sing Me A Love Song, gets a ballad treatment. �Getz used to play it as a samba, and Miles recorded it years ago on Quiet Nights in 3/4,� Ries recalls. Thelonious Monk�s �Ugly Beauty,� arranged by Dennis Irwin in mid-tempo swing rather than waltz time, is the upbeat quartet closer. Ted Panken - �Downbeat�; WKCR-FM, New York.